Attended the Easter Parade today on 5th Avenue with my friend Coco. As usual I forgot to get a picture of me. I think about a thousand people got pictures of Coco and I. I even got a call earlier that someone saw me on the news. We had at least 4 different stations take clips of us. 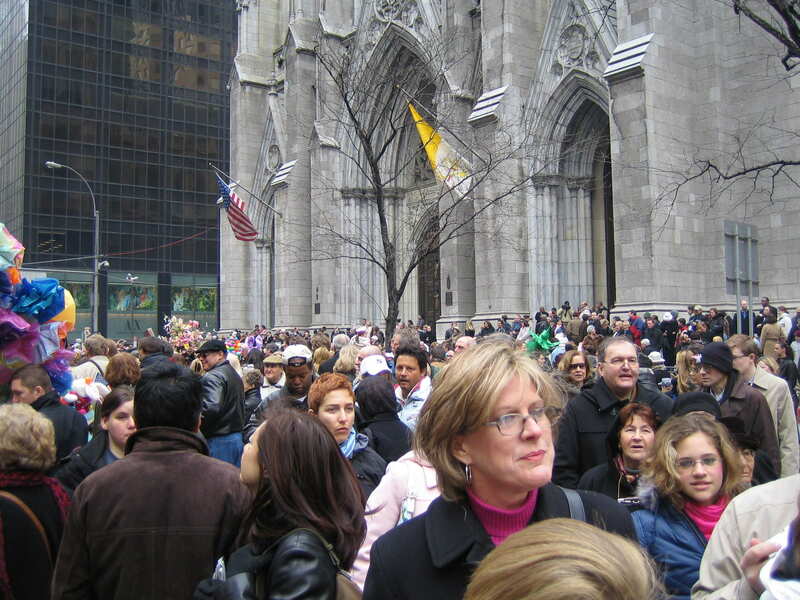 Crowds on 5th Avenue in front of St. Patrick's Cathedral for the 2005 Easter Parade. 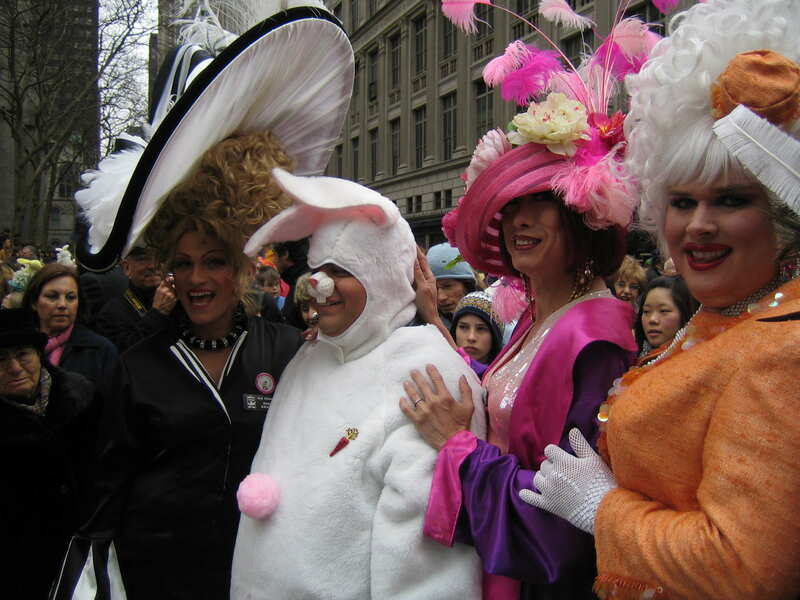 Crown Princess Robin, Crown Prince Tony, Empress Coco and Empress Trai La Trash at the 2005 Easter Parade on 5th Avenue in Manhattan. Just got home from an evening out on the town. Wow, have not had that much fun for a long time. My friend Coco is in town from San Diego where she now lives. Went over and picked her up at her apartment on 10th Street, then headed over to Splash Bar. She was meeting someone there for business so I got to tag along. Had a fun time. Then went over to another small bar to check on some items for next week. Then went over to The Web where they asked Coco to host the show. Finally back home and ready for bed. Sure glad I had a nice nap this afternoon. Only in New York will you hear that the Mid Town tunnel is closed due to the Elephants being marched from their staging area to Madison Square Gardens because the circus is in town. But that was last night when I came home from the academy. Very good class last night on Firefighter survival and two-in, two-out regulations and procedures. Everyone seemed to really enjoy the class. Tonight I have a study group at Starbucks so will be very busy. Oh, and we are supposed to get some snow today too. Oye! Just been rather busy recently. Last night I was at LIPS in The City for an In-town awards dinner. Then on Wednesday last week we had a study group at Starbucks for Fire School. The ball is only 12 days away and I have lots to do for it. Then again, my final test is only 3 weeks away (on April 7th) so still have work to do for that. But down to the last few classes. Got laundry in the wash and need to move it to the dryer. Only 4 days until Spring and it is still only 32 outside. Hopefully it will get warmer SOON. Finally figured out what a Bodega was. They kept talking about a Bodega owner being shot and killed in Jersey City (I think it was). But I had no idea what a bodega was until I finally saw the spelling scroll across the TV so looked it up. Here it is for all my friends from Oregon that also have no idea what a Bodega is. A small grocery store, sometimes combined with a wine shop, in certain Hispanic communities. Due to scheduling conflicts they changed my last two fire school class dates to Saturday, April 2nd. That is the same day as Night of a Thousand Gowns so I will have to take a make up. Rather upset about it. Oh well. Other than that, everything is just hectic right now with the ball coming up and lots going on with me. Oh, on the positive side I joined Weight Watchers at Work 4 weeks ago. Every Tuesday is weight in so I went today. I was rather concerned about it because I missed last week traveling in Cincinnati and have not been that great. Good, but not great. I was so thrilled. I lost more and my total now is 8.8 lbs off in 4 weeks. So I am rather pleased with that. Got to get some sleep. Home sweet home at last. What an interesting last few days. Started off Monday flying to Cincinnati for a business meeting. The trip was fine. Flew out of Newark and made it into the Cincinnati Airport (actually located across the river in Kentucky) and then got our rental van and drove over to Mason, Ohio (on the other side of Cincinnati) where the meeting was. Had brunch at a Cracker Barrel. Very interesting place. Good food. And then had a great meeting. That evening the 12 of us all went to dinner at a nice Italian local place. Again, food was good and company was great. Had a nice time talking with the people we came to meet with in a non-formal dinner environment. Hotel was fine, nice big rooms. Got up, checked out and headed to work. Oh, Tarek and I tried to find the local Starbucks and Ohio won. No Starbucks. Turns out that the local one was inside of a super grocery store down the road with very little Starbucks frontage on the building. Meeting was great Tuesday morning, then I get an email from Continental that our flight was delayed and then cancelled about an hour later. Newark was having an ice / snow storm. We were rebooked on a later flight. So we took our time. Finished up and headed for the airport. After we get there, I realize that I have left my computer bag back at the front desk because I was distracted when we headed to the van. We had another person in our party that was flying to Philadelphia instead of Newark and their flight was on time. Anyway, so Tarek and myself head back to the office (about 30 minutes away). No rush since our flight was delayed for another 2 hours. We get back to the office, get my bag and check the web for Starbucks. Ah, ha. We have the technology. The web indicates a store back a few exits toward Cincinnati. The gal at the desk knew where that was and provided us excellent direction. Off we went to the Starbucks. Tarek was upset because the guy behind the counter gave me a free drink since I was wearing an out-of-state fire department shirt (giggle). Then we head back to the airport. Check the van in and head over to the gate. Five hours later and after dinner we finally get boarded on the plane. Great. We are out of here. Oh, not yet. We had to pull out to get de-iced. First time I can recall ever having to be de-iced. Ok, great. Now we are on our way. We get out to the runway and then park off to the side and the engines shut down. Oops. This is a bad sign. The flight crew informs us that Newark has been closed and that they are projecting us to sit for 50 minutes before being able to take off. About 30 minutes later the engines kick in and we are able to take off. About 2 hours later the flight crew lets us know that Newark has been closed again and that they think we could get landed later after midnight but that we were low on fuel at that point and with no guarantee that we were going to make it into Newark, we had to divert to Pittsburg. Oh grand. All the way back to Pittsburgh, PA. Hey, that is about 50 minutes west of where we needed to be and the total flight time was only suppose to be 1 hour 40. Hmmm. So we land in Pittsburgh. The concourse is closed down, lights off and everything. The gate crew is being called in to open up for us. The general manager for Continental Pittsburgh was there with a few people that he could pull together to get us parked as a gate. We get up to the gate finally after sitting on the taxi way for another 20 minutes. They finally tell us that hotel arrangements have been made for us and where to get our bags and the shuttle to the hotel. This is really a no tell motel that they put us in. Oh well. In the morning - this morning - we call into the 800 number and they know nothing about anything except we are confirmed on the 5pm flight out of Pittsburgh. Hello. Totally unacceptable. Finally we are asked to call back at 7am Central Time. Ok, I do. I get a very helpful guy at the airline that understands what I was talking about. Sure enough. He finds me and my traveling party and this new "special" flight from Pittsburgh to Newark leaving at 9:40am. Oops. It's 8:15am by now kids. And when were you going to tell us that we were on this flight? So we dash to throw things together and get downstairs. While we wait for the shuttle to pick us up (oh yeah. The hotels are like 15 minutes away from the airport in Pitts) we have a small breakfast from the hotel there. Finally we get over to the airport and the ticket agent can not print boarding passes. So they give us gate passes for security. Ok, we go down to security. The first security person takes our security gate pass and everyone after that keeps asking us for it. We have to be hand searched and hand wanded even though we passed the regular screening. We get down to the gate and everyone else is on board except us. But we made it. Oh the plane we go. Taxi out to be deiced and off we fly into the sky for Newark. Nice flight, bumpy, but short and sweet. Landed in Newark just fine. Got to my car, all is well and I am headed home. Do some work, work from home. Then sleep for a spell. Oh, had a nice lunch at Boston Market on my way home. That was great. The little breakfast back in Pittsburgh was not sitting to well. I was rather hungry at that point. It was after 12pm by the time I got from Newark to the UPS Store to pick up my mail and then over to the Boston Market. Got back to my place around 1pm. Did the work stuff, some personal stuff on the computer and then slept for a few hours before getting up and going into The City at 6pm for a Board of Director's meeting tonight. Just got back from that and now it is around 12:10am so I am headed to bed. But wanted to type this all out and get it posted while I am still worked up over it. Funny how I am looking forward to work tomorrow to get myself back into a routine. Oh, and I got a call from the Fire Chief's secretary for Hasbrouck Heights. They want me over at the Police Department for fingerprinting again at 3pm for my Fire Fighter application for Hasbrouck Heights. My last meeting was from 1 to 2 but then that was cancelled after I made the 3pm appointment. Later, it's bed time. Tiffany was sure glad to see me. Now she is over it and sleeping in her chair. Just taking a few minutes to check email and eat breakfast. Had some fat-free cottage cheese and about to eat the last banana in the house before finishing packing and headed out of here. The Starbucks in not even open at this hour. My flight starts loading at 6:30am I think it said so should be leaving here no later than 4:15am to get there in plenty of time. Could make it later but since I am up, why wait? Took out the cat box last night so just need to feed and water Tiffany before I leave. This computer is not going with me so will be off line until Tuesday night. Later. In simple terms, a blog is a web site, where you write stuff on an ongoing basis. New stuff shows up at the top, so your visitors can read what's new. Then they comment on it or link to it or email you. Or not. (n.) Short for Web log, a blog is a Web page that serves as a publicly accessible personal journal for an individual. Typically updated daily, blogs often reflect the personality of the author. (v.) To author a Web log. Other forms: Blogger (a person who blogs). So I think I was ahead of my time. My blog log archives go back to 1999. Anyway, I have to get a few things done here and then get ready to head into the city around 2pm. I already checked in for my business flight tomorrow to Cincinnati, Ohio. I got an emergency row aisle seat. More leg room for me. But I still need to figure out what I am going to pack for such a short trip. I am going to try to take just a carry on bag with my laptop. Had a nice day. Got up this morning and went to the gym. Then cleaned the kitchen and had breakfast. I then headed out to Fishkill, NY. A little over an hour north from here. We have a Patient Service Center there that was moving. So I went up to help Stephen since he was working the Saturday. We also went to lunch after we finished. We had 5 systems to install. I mainly unpacked things, did paper work and tested systems. It was a nice drive up since I had really never been up in that area. After I got back home around 4pm, I did laundry while I watched some M.A.S.H.. After that, I was tired so I went to bed around 7:30pm and just got up. Now going to have a little bit while I watch some TV before heading back to bed. Had a fun time last night. Got to tear apart a car. We had extrication training last night at Fire School. Tried to get things taken care of at work today. Lots going on and I am in Ohio Monday and Tuesday. Snow continues to fall. Looks like about 6" outside but that is only looking out the window. 7" officially in Central Park. Snow flurries are to continue for today and into tomorrow.